Then comes Herb Seafood Crepe Casserole which ups the ante in culinary skill and savvy. Kris and Mark are utterly floored by the cooking methods employed by Chef Pablo "Boy" Logro for this utterly divine masterpiece. Every juicy morsel leaves a memory in the tongue where one desires to chew endlessly, unwilling to finally swallow as it will cut short the astounding culinary experience. 1 Marinate all seafood's with olive oil, chopped basil leaves, mustard, salt and pepper and white wine. 2 Put marinated seafood's into triangle-folded herb crepes; and place them into casserole dish with béchamel and tomato sauce. 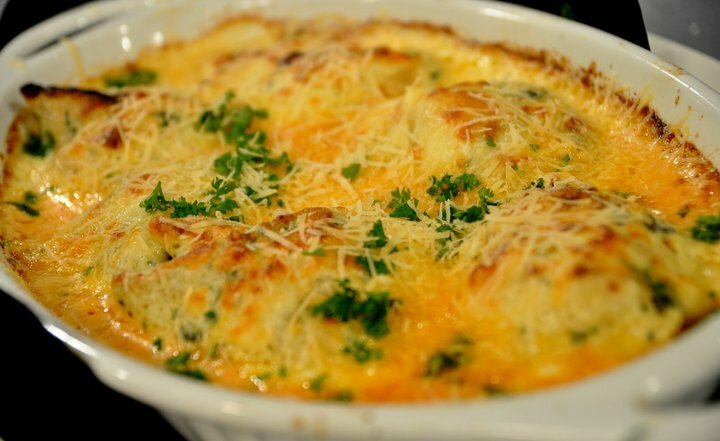 3 Cover with grated quickmelt cheese and mozzarella cheese then baked in oven for 30 minutes or until done.